The last of this series of notes on the Founders of the Club International des Anciens Pilotes de Grand Prix F1 (The Grand Prix Drivers Club) reflects on the man who became the first ever Formula 1 World Champion, Giuseppe Farina. He was a very quiet and slightly introspective man and one wonders what he might have thought if we could transport him to a modern grand prix and see a race winner leap up and down on the podium and then spray champagne over everyone. Shocked, probably, as Guiseppe Farina did not like fuss and everything about him, even his driving style, was upright but totally relaxed and his long-arm technique at the wheel was regularly copied by young up and coming drivers. Also, one must remember he was 44 years old when he won that initial World Championship back in 1950 and had first competitive event twenty five years before that, in 1925 , when he ran his Alfa Romeo in the Aosta-StBernardino hill climb. The son of Giovanni Carlo Farina, the founder of Stablimenti Farina, the coachbuilders, he studied political science at University and joined the cavalry but soon gave that up to go motor racing. 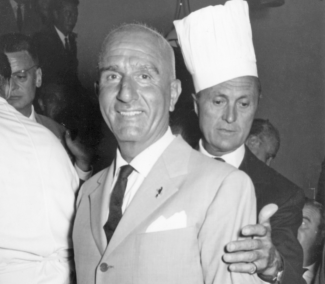 Meanwhile his father developed the coachbuilding business bringing in his own brother, Battista Farina, who was later to split from the family coachbuilding company to form what today we know as Pininfarina. With Guiseppe – who was always called by his nick-name Nino going motor racing it was left to Nino’s brother Attilia to follow the family tradition in coachbuilding. 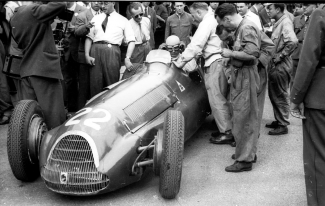 Nino Farina quickly proved to be very fast and slightly accident prone but his friendship with the great Tazio Nuvolari saw him develop into a reliable pair of hands at the wheel. Nuvolari helped get him a drive with a Maserati and later an Alfa Romeo. With the rise of Auto Union and Mercedes Benz, Alfa Romeo were struggling to keep up and Farina was drafted into the team by Enzo Ferrari. He he won a few minor events including the Prix de Berne so it was no surprise when he won the Italian Championship three times leading up to World War II. When racing restarted in 1946 Enzo Ferrari brought him back into the Alfa Corse team and he ran his first event for them in June 1946 in the Coupe Rene La Begue held at St Cloud. He was partnered by the French driver Jean-Pierre Wimille and was holding third place with his 158 Alfa Romeo, battling with Raymond Sommer’s Maserati, but he burned out his clutch and had to retire. A month later he had one of his most important race wins in the Grand Prix des Nations in Geneva that was run in two heats and a final due to the large entry. His team-mate Wimille won heat one and Farina won heat two. 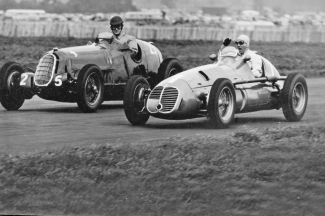 In the final the two Alfa drivers battled it out but Wimille and Nuvolari tangled which gave Farina the chance to pull away and win the race. Sadly he had an argument about who was team leader and as a result Farina was dropped by Alfa Romeo in 1947. For 1948 Farina decided to be a private entrant and bought one of the new 4CLT Maseratis which he entered for the Monaco Grand Prix that year. He put the Maserati on pole position and won the race half a second ahead of local hero Louis Chiron in a Talbot. Farina continued to race his Maserati in 1949 but for 1950 he was brought back into the factory Alfa Romeo team driving the legendary 159s. Now called Formula 1 this was the first year of the World Championship and the first event was the British Grand Prix at Silverstone which Farina won in pouring rain ahead of team-mates Luigi Fagioli and Reg Parnell. This set him on his way to winning the World Championship. At Monaco he set off in the lead but was passed by Fangio. Trying to fight back Farina lost control of his Alfa at tabac and hit the wall creating a monumental pile up of cars that took nine of them out of the race. Two weeks later and Farina won the Swiss grand prix and finally the Italian Grand prix to win the title. He stayed with Alfa Romeo for 1951 but won just one grand prix as he was dogged with mechanical problems towards the end of the season. 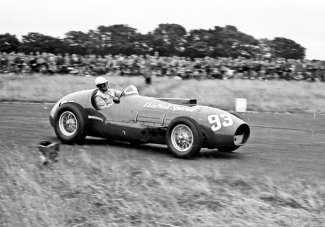 Alfa Romeo withdrew from the Championship and so for 1952 what was then Formula 2 became Formula 1 and Farina moved to Ferrari. From then to the end of his career he only won a single grand prix, the German Grand Prix of 1953 with a Ferrari four cylinder 500 model, however his consistency saw him finish second in the World Championship in 1952 and third in 1953. By now his great rival was Alberto Ascari. Nino Farina suffered many accidents but after recovering from one on the Mille Miglia he badly burned his legs in an accident at Monza where his car caught fire. He returned to racing but 1955 but was constantly in pain so it was to be his last season. It was not, however, his last racing appearance for went to Indianapolis with a specially prepared Ferrari. He was injured again in a sports car race at Monza and finally retired. His interest in grand prix racing did not wane, however, as he was one of the ones who was interested in the formation of a Club for former grand prix drivers so that they could meet together at racing events. Thanks to the efforts of Baron de Graffenreid this club was formed. Meanwhile Farina was involved in the motor trade with Alfa Romeo and Jaguar dealerships and in 1966 when the film maker John Frankenheimer decided to make his classic Formula 1 racing film “Grand Prix” he engaged Farina to help with various technical details on the film and also to stand in for Yves Montand in some of the staged driving sequences. This called for him to attend the races in which Frankenheimer intended to film and on his way to the French Grand Prix he went off the road in his Lotus-Cortina near Aiguebelle, hit a tree and was killed. Guiseppe Farina was a regular attender at Club affairs and was greatly missed by the members, many of whom were at the French Grand Prix that year looking forward to him turning up for a Club meeting but it was not to be for our first Formula 1 World Champion.